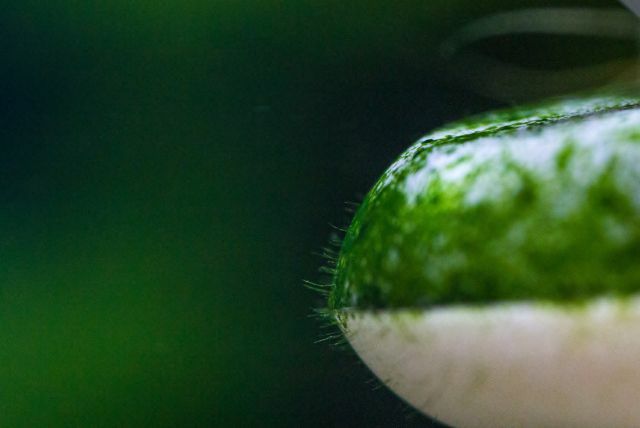 Algae in the aquarium might be the greatest nuisance for every tank keeper, be it in a classic social tank, an aquascape, a biotope aquarium or in breeding tanks for fish or shrimp. When confronted with an algal infestation, many aquarium keepers simply give up their beautiful hobby. However, there are good ways to get a grip on these pests, to fight them off or to prevent them from spreading. The term "algae" is basically a comprehensive term for a vast number of different organisms. All plants not belonging to the mosses (liverworts, true mosses and hornworts) or the higher plants (ferns, Lycopodiopsida and seed-bearing plants), are classified as algae. Amongst them we have microscopic unicellular organisms and thread-like forms as well as the so-called macroscopic algae, like seaweeds, some of which can reach a length of up to 60 meters. For life on Earth, algae are crucial. Just like germs, i.e. viruses, bacteria and other microorganisms, the smallest algae forms are omnipresent in our environment. There are some algae that float in the air passively, the so-called aeroplankton, in order to reach new places to inhabit. For our aquaria, this means that their omnipresence makes an aquarium that is absolutely free from algae practically impossible. 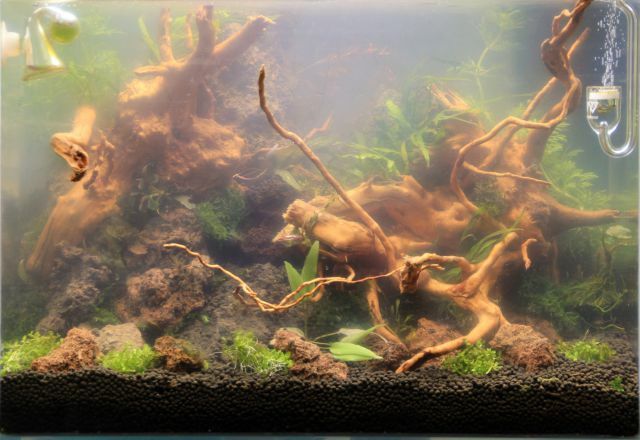 The reasons stated above make it pretty clear that algae form a part of every aquarium. There are no aquaria without any algae, despite the most dedicated care. 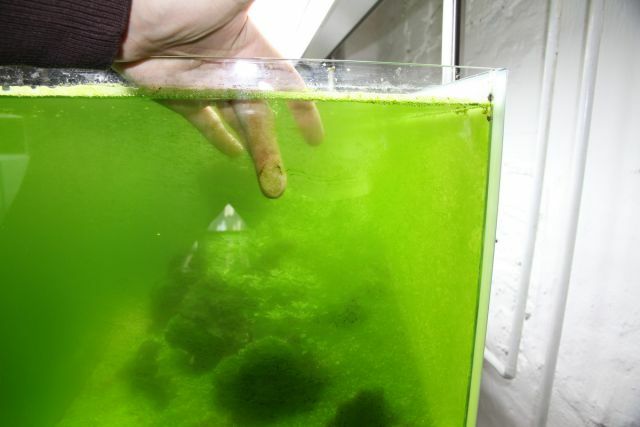 Of course there are tanks that do not have any obvious algal growth, however, we cannot see the tiniest microscopic algae (most of them are unicellular) that are mostly present in the biofilms. Biofilms form on all the surfaces in the aquarium, and besides algae, they contain different microorganisms. They are nothing that needs to be removed, on the contrary - biofilms are all-important for the biological balance of a tank. Moreover, many aquarium inhabitants feed on biofilm, which is great food for them. 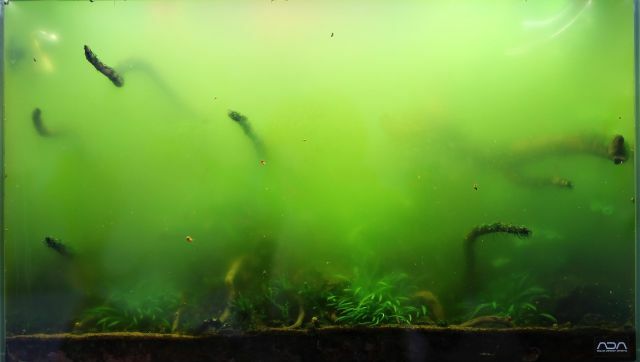 During the cycling phase of a tank, when the biological system is still finding its stability, a certain algae population is perfectly normal. Diatoms will form during the first few days to weeks, and after that, in their place, green algae will form. 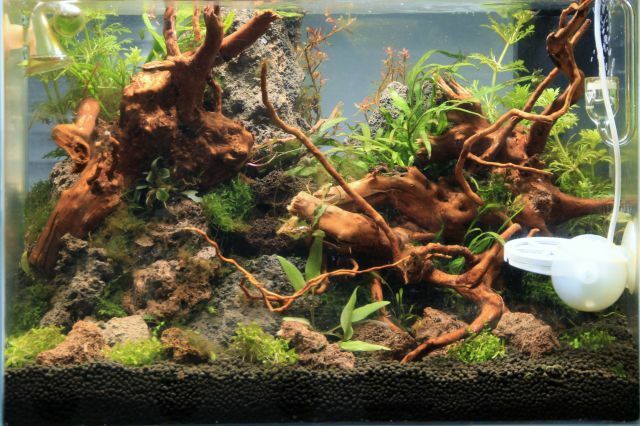 In the long run, however, it is possible to have an aquarium without visible algae, and this is even realistic for beginning aquarium keepers. Just keep some basic things in mind and inform yourself about the reasons for the formation of algae. As we have already mentioned, especially during the first few weeks in the life of an aquarium, the formation of algae is very probable. Frequently, the ecological balance has not yet been established in such a tank. In this case, you'll need to be patient until the system is balanced. The relation of algae to aquatic plants is not yet balanced in the beginning either. Stronger plant growth will shift it towards the plants, at the detriment of the algae. 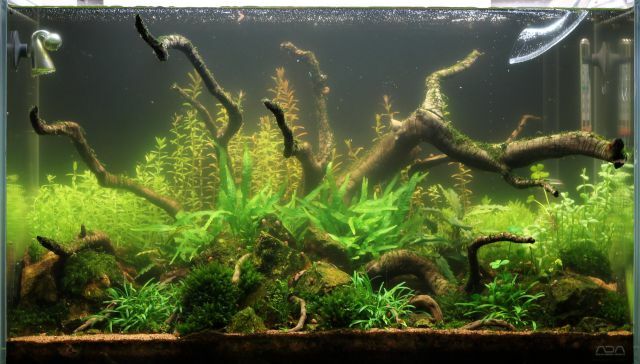 For this reason it is rather important to start the tank with a good plant population and to use fast-growing stem plants. Until the tank has found its biological balance we recommend controlling the algae with specific measures for each kind. First and foremost, the use of a sufficiently large number of algae eaters is recommendable. The most efficient algivores are Amano shrimp and nerites of the genera Vittina, Neritina and Clithon. But why will algae form in an aquarium that has been standing for quite a while? In a planted tank, this may happen due to a nutritional imbalance. In these cases, algae will find highly favourable conditions, which they will use for visible growth. We have defined "nutrients" (based on this article) as all parameters of the four basic groups comprising the elements light, CO2, micronutrient and macronutrient fertilisation). In former times, people used to think that single nutrients like phosphorus or nitrogen were responsible for algal growth, however, this theory has been proven wrong. In an aquarium, you can find (and measure) nitrogen in the form of nitrate and phosphorus in the form of phosphate, for example. These nutrients are crucial for plant growth, though. If they are deficient, the plants will not grow well and cannot compete against the algae. A nitrate or phosphate deficiency will thus not prevent algae but can actually be the cause for algal growth. Only switch on the lights for six hours in the beginning. When the biological system in the tank runs stable and without problems you may increase the daily lighting time by half an hour per week. Under moderate to strong light, you are aiming for a daily lighting time of 8 to 10 hours, under less strong light, a longer phase of 10 to 12 hours is recommendable. With the help of our light calculator you can easily find out which category (low/medium/strong) your lighting system is in. When the aquarium plants start growing their nutrient requirements will increase, so you will have to adapt your nutrient supply to their growing needs. You can find more detailed information in our article "fertilization during the cycling phase", which treats just that subject. 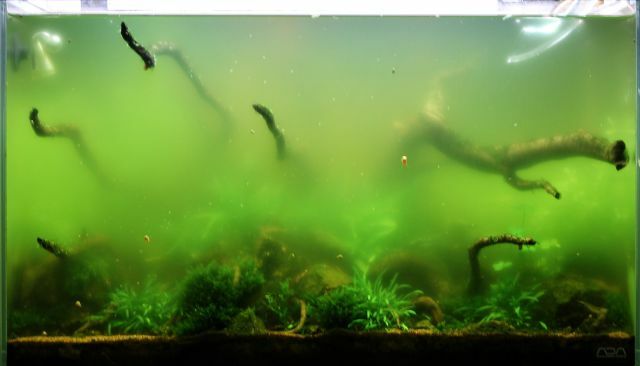 Most nutritional imbalances and, in their wake, increased algal growth, are usually caused by slacking tank maintenance, for example if regular water changes are skipped. A regular, ideally weekly, water change of around 50% is vital for the overall development of an aquarium, and it may prevent algae. Besides the addition of fresh, unpolluted water, by changing water you remove unwanted substances and prevent certain elements from building up in the water. A 50% water change will keep the nutrients for your plants at a suitable level. It prevents nutrient peaks, and you may even be able to do without weekly water tests to monitor your parameters. However, there may be other situations that are responsible for a nutritional imbalance, like for example sloppy fertilisation, lights that are too strong or that are left on for too long, a CO2 bottle that has run empty, or even changes in the environment, like different light or a relocation. Even seasonal temperature fluctuations can be responsible for such a change. If you find a sudden increase of algae you first need to identify them correctly and then take suitable countermeasures. In addition you should try to find out what has caused the infestation in the first place and find a remedy. In order to help you diagnose algae correctly we have drawn up a rough summary, which you will find in the following. In the next articles we will go into much more detail on the different types of algae, the way to control them individually and on typical reasons for algae. Red algae (Rhodophyceae) in freshwater aquaria usually belong to the very wide-spread staghorn and black beard algae (BBA). Their colour is not red by nature, they are usually grayish. However, they turn reddish when you immerse them in alcohol. This test makes red algae very easy to identify. Staghorn algae (Compsopogon sp.) 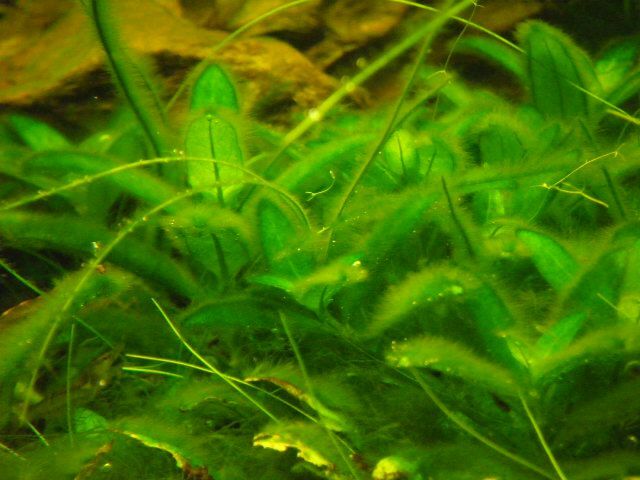 usually grow on the equipment, the decoration and on the veins of slow-growing aquatic plants. They hold on to their substrate quite firmly, are usually of a dark colour and their habit is almost wire-like or hairy (sometimes they look like the horn of a stag, hence the name). For further information, please go to the respective article. Black beard algae (or black brush algae) (Audouinella sp., Rhodochorton sp.) have a bush-like growth habit and consist of many short, densely growing filaments. They grow from one common point. Their forms makes them look like a tiny brush. Their colour may vary from dark green over gray to a deep black. Exactly like staghorn algae, brush algae usually grow on the equipment, the hardscape and on the leaf margins of slow-growing plants. There they are anchored quite strongly, and entirely removing them mechanically (by plucking them off) is almost impossible. You can find more information about these algae in this article. 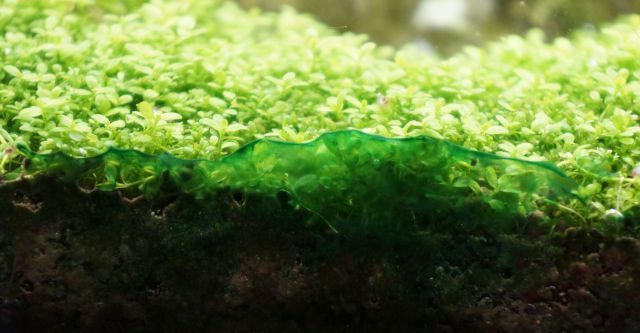 When we talk about algal films we talk about those algae that grow like a carpet, covering plant leaves, the glass, the substrate, the equipment and the hardscape. Many different algae do this. Brown algae is also called Bacillariophyceae. They often form brownish coats that cover all the surfaces in the aquarium. They're called brown algae due to their colour, however, this is not quite correct, as true brown algae are a different group that is practically exclusively found in marine waters. Often, diatoms form during the first few weeks in the life of a new aquarium, and in most cases, they go as they came - all by themselves. For more information, please go to this article. From a biological point of view, these slimy, blue-green coats are no algae at all, but cyanobacteria (blue bacteria). They grow as a film on plants and decoration and are easy to identify thanks to their strong, foul smell. You can often find them in the substrate on the aquarium glass (as you can see in the photo). For more information about blue-green algae please go to this article. 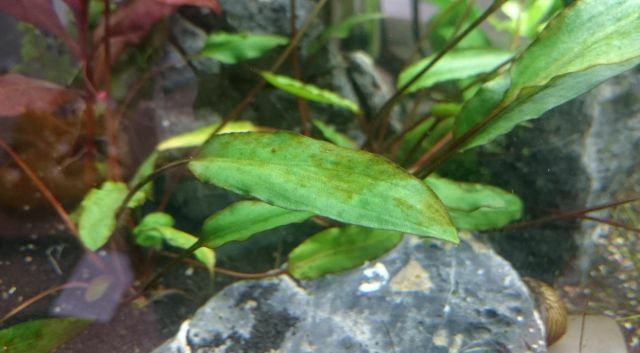 Green spot algae (probably almost always species of the Coleochaete family) are green, spot-like algae that usually grow on the aquarium glass and sometimes on decoration and on the leaves of aquatic plants. They are frequently found in strongly-lit tanks. These algal crusts are hard to remove from the glass, you'll need a blade cleaner to do so. For more information on spot algae, please go to this article. Green dust algae resemble other hard algal films, however, if you touch them they are somewhat slimier and can be removed easily just by wiping or by water movement. If you try to remove them manually, you'll have a green dust in the water, which settles after a few hours, forming new films. Those algae are very obnoxious, and some people in Germany have called them "green glass pest". 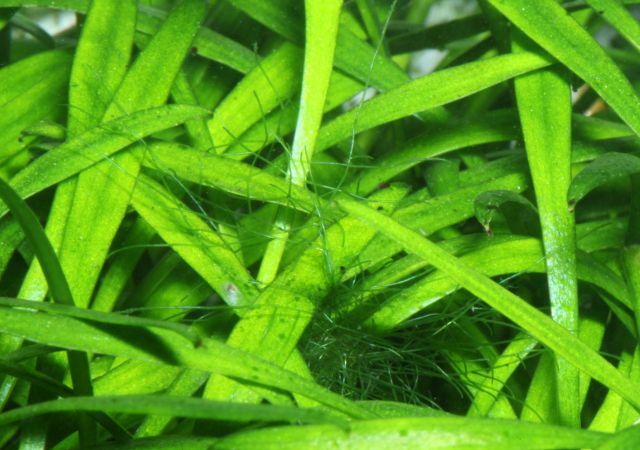 This term has been coined in the aquatic plant forum flowgrow.de, however, the exact species of this algae is still unknown. In this article you can find out more about them. The common green algae coats that will form on all the surfaces in the tank are pretty much harmless. In contrast to spot algae, their growth habit is wider. They will cling to the surface more or less firmly, some of them can be removed manually. We have collected further information about these algae here. These algae float in the water. They can cause considerable clouding. Turbid water may also be caused by a bacterial bloom, though. Green water is caused by tiny, free-floating algae that add a green stain to the water but do not settle on hard surfaces. Usually they belong to the genus Chlorella. In this article you can find out more about them. 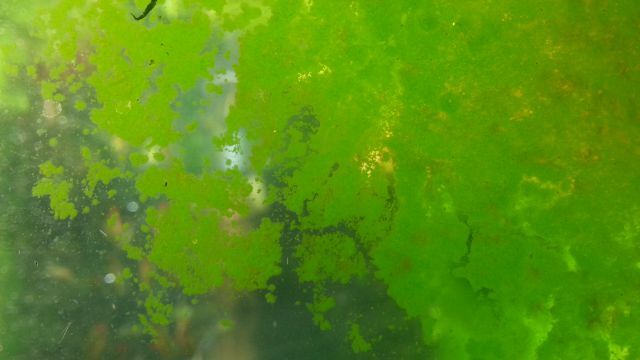 Just like green water, a bacterial bloom can cloud the water in the aquarium considerably. However, the water is not green but of a milky light gray. This phenomenon is not due to an infestation with algae but to strong bacterial growth. For further information, please jump to this article. Here we have a compilation of the most common green algae in freshwater aquaria that grow in filamentous form (in different lengths). Their growth habits differ somewhat. Green thread algae consist of long green filaments. There are several species that grow like this. These filaments are rather soft and not very sturdy. Their base does not attach strongly to the substrate but the filaments wrap around plants or decoration. You can use a chopstick to wind them and to manually remove them. 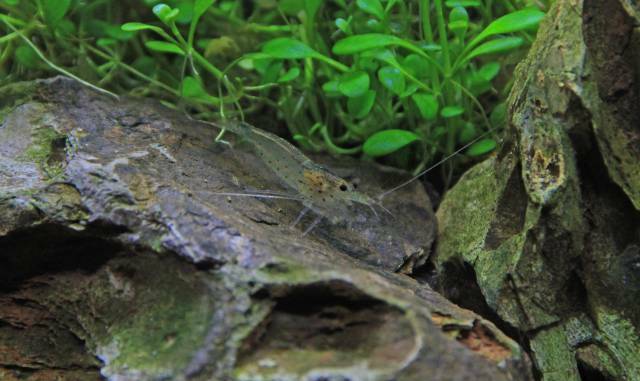 A decent number of Amano shrimp will help keep thread algae in check. For more information about thread algae, please go to this article. These light green algae form very soft, cottony cushions. They can grow to a length of around 4 cm. 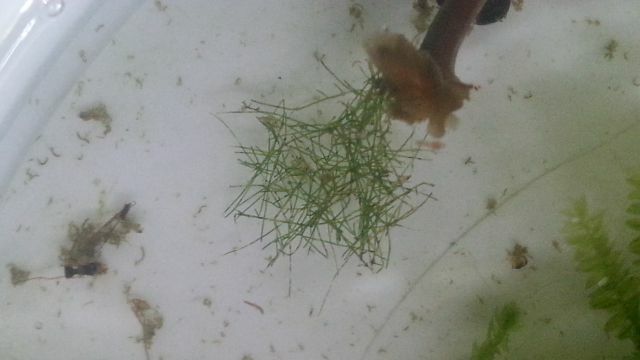 There are several algae species with this growth habit. 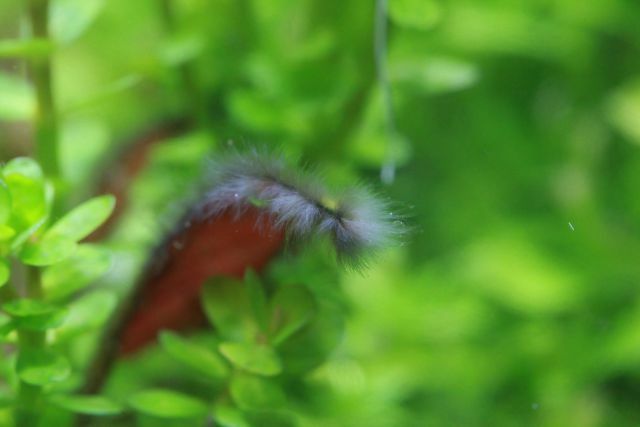 Algae eaters like Amano shrimp munch on them and keep them in check very reliably. These green algae grow in the form of individual short filaments, mainly on the leaves of aquatic plants or on decoration. This algae can be controlled quite easily if you optimise your fertilising regimen. For more information about these algae please jump to this article. 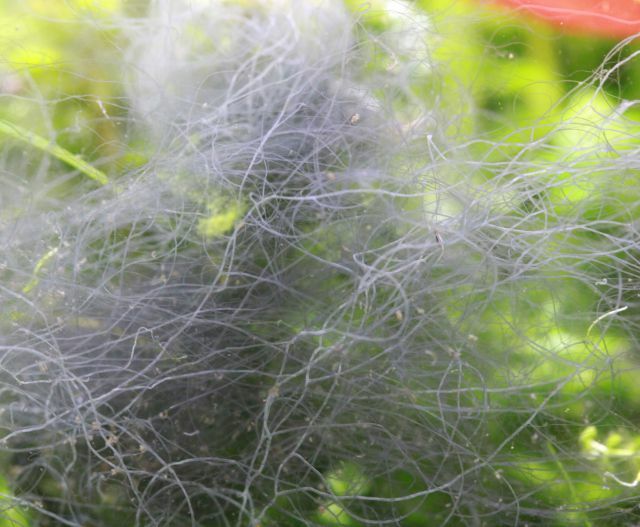 Hair algae form dense coats on plants and hardscape and can form very quickly. Depending on the species, the filaments will grow to different lengths. 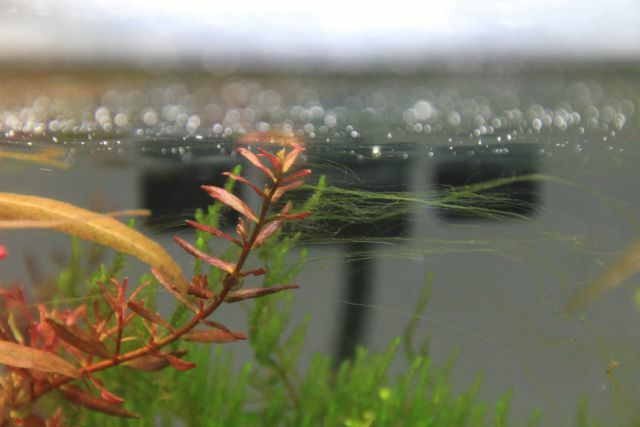 Hair algae are hard to remove mechanically as they anchor their base very tightly to the substrate. Quite frequently these algae belong to the genus Oedogonium. Here we have gathered more information on hair algae. One of the most obnoxious green algae belongs to the genus Cladophora (reticulated algae). It is easy to diagnose as it branches visibly, which leads to a bushy growth habit. It is harder than other filamentous algae and is not as attractive a food source for algivores than other algae species. For further information please go to this article.